Showing items tagged with "performance" - 6 found. How do you de-stress whilst reducing business email overload? After all it is easy to get sucked into the inbox and look up three hours later feeling stressed. What have you achieved? Maybe a clean inbox but was the time productive? In this guest blog from Lucy Miller she provides five top ways to de-stress to improve performance whilst at the same time reducing the email overload factor. With so many tips out there about healthy living habits, it can be tough to determine what advice is actually worth following. 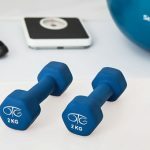 One key aspect of wellness that many people overlook is that it’s not enough to just be in good physical shape; you need to keep track of your mental and emotional health as well. Here are five steps you can take to make you healthier, both physically and mentally and especially whilst you deal with your email. 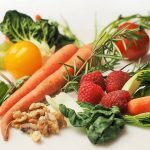 The problem with diets is not only that most people have difficulty following them, but many diets, even if followed strictly, won’t necessarily help you get into better shape. A better tactic is to keep a food diary where your record everything you eat, including and especially snacks or desserts that you’re embarrassed about and want to cut out. The reason a food diary is so helpful is that it makes you acknowledge what your diet is like and identify foods that you need to eat less of, as well as nutrients you may be lacking in your diet. Dealing with business email overload – don’t snack mindlessly when checking emails, make sure you eat what is good for you. Nutritionists and health gurus are always reiterating the importance of sleep, but many people don’t realize all the aspects of your health that sleep impacts. Not only can regular sleep reduce stress, improve your immune system, and bolster your mood, but it also keeps you functioning at optimal physical and mental levels. The key is to not only get enough sleep — at least eight hours a night for most adults — but also to keep a regular sleep schedule. 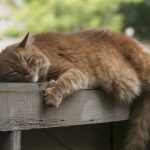 Inconsistent sleep can have a negative impact on various aspects on both your physical and mental health, and will also make it more difficult to get as much sleep as you need every night. 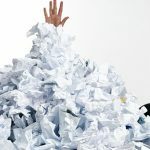 Dealing with business email overload – set boundaries outside which you disconnect and do not look at the inbox (and social media). Stress is another factor that can have a huge impact on multiple levels of wellness. People with high levels of stress are not only more likely to gain weight and have difficulty sleeping, but are also more likely to suffer from anxiety, depression, and other mental and emotional conditions. A good way to avoid over-stressing yourself is to regularly check your emotional and mental health, which can be done many ways, including taking online mental health assessments. People with high levels of stress will almost always experience problems with their mental and emotional health, so keeping tabs on your mood, energy levels, focus and concentration, and other other factors can help you determine when you’re becoming too stressed, and what your biggest stressors might be. Dealing with business email overload – as you feel your muscles tighten stop, take a break and exercise even if only for a few minutes. Regularly challenge yourself intellectually and keep your mental skills sharp. There are many ways to accomplish this. 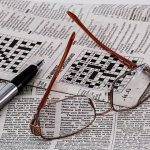 Reading regularly is a great way to keep your mind sharp, or you can work on mentally simulating activities like puzzles or crosswords. Another easy option is to get into discussions or debates with friends about topics that interest you both, as this will help hone your critical thinking skills. Anything that challenges you mentally will fit the bill, so find intellectual activities that you enjoy, whatever form they take. Dealing with business email overload – set aside some me time when you do something to challenge you mentally. Most people aren’t getting enough water on a daily basis. Sixty percent of our bodies are made up of water. Water is essential to most bodily functions, from waste removal to carrying nutrients and oxygen through the bloodstream. We are constantly losing water throughout the day, so it’s important to replenish your water levels regularly. Experts recommend drinking at least eight 8 oz. glasses of water per day, although the exact requirements for your body can vary based on individual differences. Dealing with business email overload – sip a drink after dealing with every 20 emails. By following these simple steps, you can make healthy lifestyle changes starting today. So many people make the resolution to get healthier, but forget to focus on all aspects of health, not just the physical. By keeping tabs on your physical, mental and emotional health and making healthy choices, you can maximize your all-around wellness and performance. 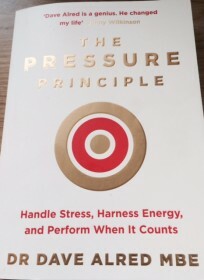 The Pressure Principle by Dave Alred. For me the motivation to read this book was a bold attempt to sink more five foot putts. Alred, coached Johnny Wilkinson. 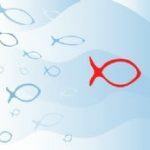 Here he distills some useful advice and exercises to help you stay focused and think positively. Importantly too how to learn from negative experiences and not let them cloud your future performance. For instance when coaching someone (yourself), turn everything into a very precise positive statement. Instead of saying don’t miss my sales target/on the left side of the hole say positive things like ‘aim to close one new sale per week’, ‘always aim for the high side of the hole’. Although written from a sports perspective, there is lots of good advice for anyone and who wants to harness the stress of performing under pressure to excel. And yes, I have made more five foot putts to win a few prizes in the past month! To use an e-notebook or conventional notebook that is the question facing business and educational institutes. Electronic notebooks such as OneNote have many advantages and especially for keeping track of useful web-based material (eg links and videos). Indeed I love OneNote for storing and sharing such content. Having my iPad in a meeting means files can be instantly accessed. Meeting notes produced as the meeting proceeds and shared instantly at the close. However, they also have some significant drawbacks. Not least the temptation to multi-task. You pretend you are listening and taking notes but in reality you are checking emails and social media sites. Not very productive use of anyone’s time and especially yours. Indeed some university lecturers have banned the use of such devices in an attempt to encourage more conversations and networking. Conventional notebooks offer many different benefits. Taking notes helps improve memory and concentration. You could argue that this is device independent. But in my case, writing and mind mapping helps clarify my thinking. Perhaps because I have to concentrate that bit more with no spell-checker. Also there are no distractions (from new emails and social media alerts) which proves to be a major drain on productivity. Drawing and colouring can on the one hand help us relax and on the other rev up our creative juices. Useful in a meeting/lecture where either you want to tune out as it’s boring or the reverse because you have an idea to contribute and need to crystallise it before speaking. Though taking a colouring book into a meeting might look just as odd as peeking at social media. One other drawback of a note book is that they can look boring and samey. If you are not careful you might end up walking off with the wrong notebook and leaving your most personal secrets in someone else’s hands. It has happened to me! The other day I wandered into Pukka Pads who sponsored my latest book ‘Taking Control of Your Inbox‘ to collect some paper. There in the design room was the answer to my prayers – a ‘Colouring Project Book’. 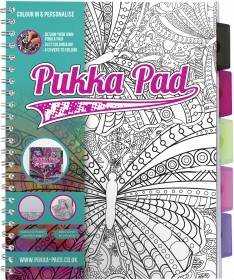 It has the most amazing Doodle Bar on each page which you can colour as you go along and hence improve your creativity and concentration. If like me you always have coloured pens for note-taking no one will know what you are doing. The front can be coloured so you know it’s yours. Opening a personalised notebook is a quick way to be noticed and stand out from the crowd. Until now such stationary was very expensive and beyond the means of most mere mortals. For me using a conventional notebook always helps improve my concentration, creativity and gives me confidence. In a meeting and when I walk around client’s offices I can make notes whilst maintaining eye contact and listening with no worries about finding the right app, being distracted and checking on battery life. And here is a mega anti-cyber crime bonus: in a public place if you want to make notes, conventional notebook are more secure because the prying eye of the cyber criminal cannot check your writing strokes as they can your key strokes. What do you prefer a conventional paper notebook or electronic one? A resolution is a steadfast decision to do or not to take an action for cycle to work, be more of a team player etc. Once agreed there is no going back. Whereas a goal is about an effort to achieve either a specific result and ambition, for example, reduce your golf handicap, go home on time more often, change career. With a goal you may set some intermediate steps to help you achieve your goal such as improve your golf short game, manage your time more effectively etc. We are always urged to set New Year’s Resolutions, yet how many of us find that within a week they are shattered and we crawl back into old habits? A better option is to set goals because they are more enduring and we can look back over time and can measure progress. Reducing email overload should be a goal for everyone who care’s about their own and colleagues’ well-being and performance. 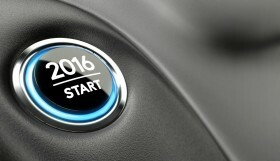 Lets’s all work together to make 2016 the year we regain our perspective and work-life balance through corporate reducing email overload. Based on the many workshops and webinars run in 2015 here are seven goals for helping you and your business reduce email overload. Step away from email for at least one hour a day and use that hour to walk and talk to the senders. Stay focused on the task in hand and do not allow new emails to distract. Apply the 80:20 rule to help prioritise what emails are really need (ie 20% of the emails received will provide 80% of the information need). Reduce the number of people to whom each email is sent. Take action immediately after reading an email instead glancing at it and leaving it lying fallow in the inbox: that action can simply be to folder/delete it. Keep emails short which will helps save everyone time (you the writer and the receiving when reading it). Only deal with emails between 8.30 am and 8.30 pm. Setting goals like these you can allow yourself an occassional day’s relapses and yet still feel at the end of the week that you have made progress. Meanwhile, if you need some more help in 2016 why not either call us about how our Brilliant Email workshops or just buy a copy of the ‘Brilliant Email‘?